Published: April 26, 2016 at 10:11 a.m. Updated: April 26, 2016 at 10:27 a.m. The prospects have been pored over, the team needs have been examined and the big trades have made headlines, but now -- at last! -- it's almost here: the 2016 NFL Draft. Before the latest crop of fresh talent is dispersed across the league in Chicago later this week, let's take one more look at the collective group and assemble an all-star roster of rising NFL prospects. Here is my 2016 All-Draft Team. 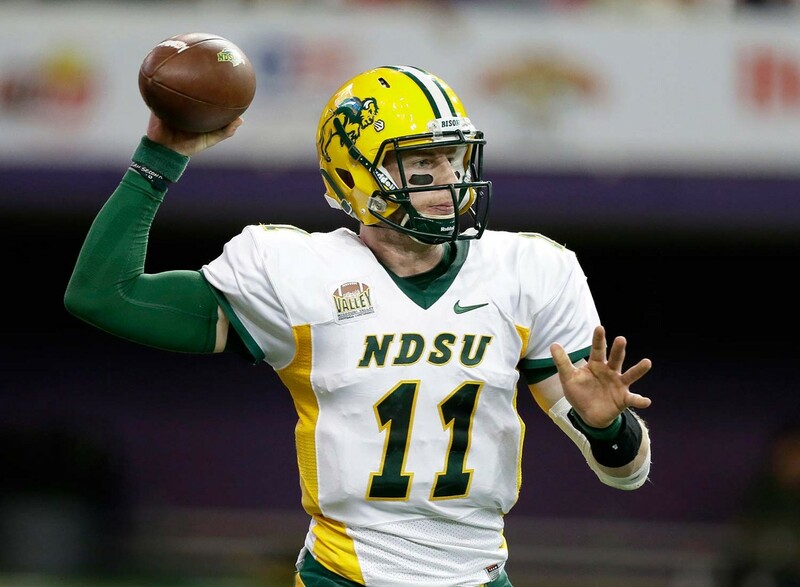 Wentz is very smart, has a good delivery and moves well in the pocket. His upside is pretty much unlimited, because he appears to have all the traits you need to be successful. He also seems to relish bringing a team back from behind. It was a coin flip between Wentz and Jared Goff for this spot -- it reminds me of the Alex Smith vs. Aaron Rodgers debate of 2005 -- but I was swayed by Wentz's sturdiness. I know Wentz will have to adjust to the superior competition level of the NFL, but I wouldn't be surprised to see him succeed and start as a rookie. He has that "wow" factor that will make him a fine early candidate for 2016 Offensive Rookie of the Year. Elliott finished his Buckeyes career with the second-most rushing yards in school history (3,961). The durable and smart back will block and has plus-type hands for the position. The bruising Heisman Trophy winner rushed for more than 200 yards in four games last year. Henry has rare size and speed, is a good pass blocker and can catch the ball. He's an outstanding person and hard worker with great character. Coleman is very tough, competitive and has outstanding physical tools. The very explosive receiver has great upside, though he needs to work on catching more with his hands than with his body. Doctson has outstanding ball skills and will catch a lot of passes wherever he ends up. The transfer from Wyoming wrapped up his TCU career with 143 catches, 2,344 receiving yards and 25 touchdown grabs over the past two years, including 79 catches, 1,327 yards and 14 scores in 2015 -- despite missing the last three games of the season with a wrist injury. Henry was a limited participant at the NFL Scouting Combine, but he enjoyed a very good pro day. He works at blocking, is aggressive and has great receiving instincts. The son of a former Arkansas offensive lineman and captain, Henry hauled in 51 catches for 739 yards and three scores en route to capturing the John Mackey Award in 2015. He reminds me of Greg Olsen when the Panthers tight end was coming out of Miami. In his first game back from a seven-game suspension last season, Tunsil faced Texas A&M's Myles Garrett, who had 12.5 sacks in 2015 and projects as an eventual top-five pick -- and Tunsil shut him down. Tunsil allowed zero sacks and was called for holding just once in six games in 2015. The athletic Stanley will start at left tackle in the NFL for a long time. He made 39 starts over three seasons in South Bend. Over his last two campaigns, he allowed a grand total of three sacks. Conklin has played both left and right tackle, but his best position might be guard. He's very tough and competitive and should become a fixture in this league. Decker has good anchor strength and is very durable and smart. He projects best as an NFL guard, though I think he's capable of playing left tackle. Kelly is a good leader and outstanding person -- the type you need on your team. He didn't allow a single sack or get called for holding once in 2015. He'll be a starter from Day 1 and a mainstay in the NFL for years. Watch the tape of Bosa against Michigan last season -- when he notched a sack and returned a pick 28 yards -- to see how good he is. He logged 26 sacks and 24 quarterback hurries in his three college seasons, along with 50.5 tackles for loss. His father (John) and uncle (Eric Kumerow) were both first-round draft picks by the Dolphins. The 2015 Pac-12 Defensive Player of the Year has long arms and big hands, and he's very strong and powerful. Buckner, who had 10.5 sacks and five tipped passes last season, offers outstanding effort on every play. Rankins is very active with great quickness. He has strength, power and plays fast with good burst. He'll start Week 1 and operate at a high level for several years. Robinson moves well for his size -- he moves like a man about 20 pounds lighter than his 307 pounds. He's powerful and very strong, and played both tackle and end at Alabama. Some teams are concerned about how many years Jack can play, given the knee injury that prematurely ended his final season at UCLA. But he has great athletic ability -- he could play safety -- and shapes up as the potential Defensive Rookie of the Year, provided his health isn't an issue. Ragland stayed in school for a fourth year, and that last season served him well. The very competitive middle 'backer makes plays all over the field. He spent some time at Alabama with his hand on the ground at right end. The 2015 SEC Defensive Player of the Year has all of the physical traits to be a Pro Bowl player. The very athletic linebacker has no trouble playing in space -- in fact, someone might even draft him to play safety. Indeed, his 1.55-second 10-yard split in the 40-yard dash indicates he'd be able to play man coverage. The former high school quarterback played well in big games in 2015, including against Michigan and Michigan State (seven tackles in each). Florida State assistant coach Tim Brewster, who has an outstanding feel for talent, told me at practice before a game in Dallas that Ramsey's skill set at corner and safety is off the charts. In 2013, he became the first true freshman to start at cornerback for the Seminoles since Deion Sanders in 1985. Hargreaves is very competitive and has great ball skills. He has excellent feet, is a good tackler and can return kickoffs and punts. He plays bigger than his listed size (5-foot-10, 204 pounds). A good athlete who will hit, Neal is very effective against the run. He needs some work against the pass, but he's smart and should contribute to an NFL team, both as a first-year starter and on special teams. He's the kind of safety who will get his teammates lined up right. Bell possesses outstanding zone-coverage skills; when you watch Ohio State tape, it seems like he's always in the picture. He's smart, has good hands (nine picks in three seasons at Ohio State), makes a lot of tackles and has tons of upside. He could be the highest-drafted kicker in the last 10 years. Aguayo won the Groza Award in 2013 and broke the record for points by a kicker in a single season. He earned All-America honors in each of his three college seasons and also never missed an extra-point attempt. Kaser has a power leg and is capable of punting for distance. He can kick for direction and hang time, and is an A+ holder -- he looks like the next Shane Lechler. I love this Wes Welker-like player, who has speed, quickness, strength and fearlessness. He'll scare a lot of people returning punts. His father, Derrick, played 36 games in the NFL. Landes -- a former catcher on the baseball team -- can send the ball back in 0.70 seconds. He was perfect in a rainstorm versus TCU.